Jurgen Klopp: 'We have enough reasons to be positive about ourselves'. JURGEN KLOPP HAS told Liverpool fans to forget their failed Premier League title challenge in 2013-14 as they look to beat Manchester City to the crown this year. The Reds famously saw their chances of becoming champions for the first time since 1990 derailed towards the end of the campaign. The defining moment came in late-April when Steven Gerrard slipped in his own half against Chelsea, allowing Demba Ba to stroll through and score for Jose Mourinho’s team while Manchester City went on to win the title with a two-point cushion. Liverpool host the Blues on Sunday looking to avoid a repeat of that defeat and protect their two-point lead over reigning champions City. As the campaign nears a crucial stage, Klopp is eager to put the memory of Gerrard’s error behind them, saying the players are feeling positive heading into the last five matches. “It is not important to talk about what happened [with the Gerrard slip]. It is too long ago,” the German coach told reporters. “We have enough reasons to be positive about ourselves. For this season it was already different when we came back because of the negative things we experienced ourselves in the last game of last season. “The boys did really good so far and that is why we are still in the fight for the championship. That has nothing to do with other games and I really hope people don’t come in the stadium and feel that way because we need [the atmosphere] like it was in the Tottenham game. “Four years ago we were 2-1 down to West Brom at home and lost 2-1 to Crystal Palace and 15,000 people left the stadium because they thought: ‘OK, I want to beat the traffic.’ That is when I said I felt alone. Tottenham was the absolute opposite of that. No one thought: ‘They have bottled it again, it has slipped through their fingers.’ Instead they thought we have to stand up and go for it. That is exactly how it was. The former Borussia Dortmund boss praised the progress his side have made recently, having remained unbeaten since January as they aim to further extend a six-game winning streak. After Sunday’s encounter at Anfield, Liverpool travel to Portugal to face Porto in the second leg of their Champions League quarter-final tie holding a 2-0 lead from the first leg. 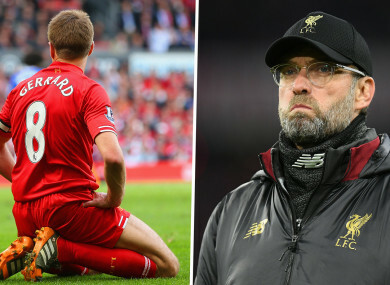 Email “'It was a long time ago' - Klopp urges Liverpool fans to forget about Gerrard slip”. Feedback on “'It was a long time ago' - Klopp urges Liverpool fans to forget about Gerrard slip”.